I've wanted to go to northern Norway since 2008, when my friend Jake did a solo whirlwind tour, with emphasis on whirlwind. This was before the area became popular on Instagram, before Lofoten Island touring became a huge industry. 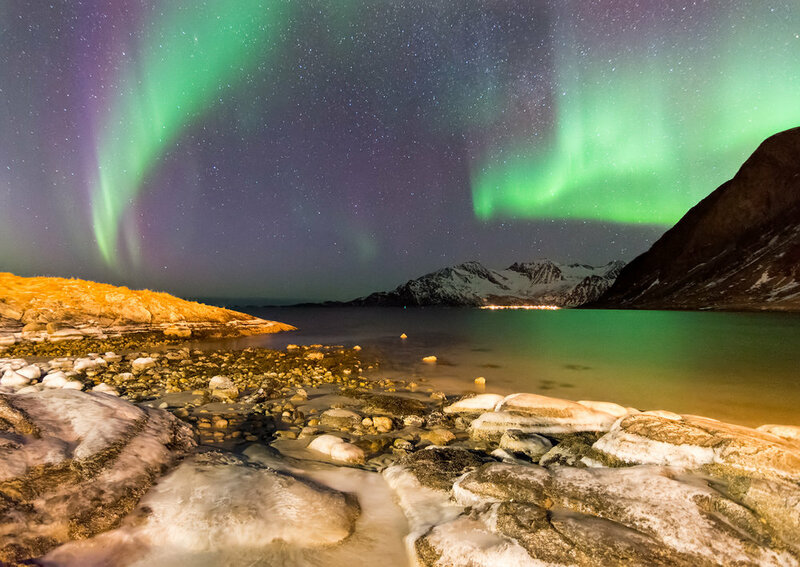 Jake went to northern Norway because it is where some of the northern-most paved roads in the world are located. For the select few months between the midnight sun and complete darkness, it's almost perfect for a landscape tour. 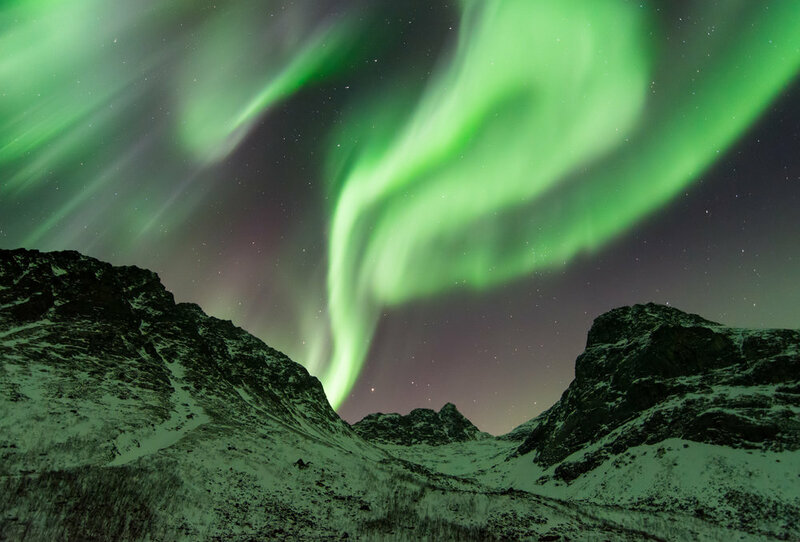 Absolutely incredible mountains by day and a good chance to photograph aurora by night. Close to the coast, the tail end of the gulf stream warms the water, so temperatures are relatively mild. Everything was ideal, and thus I felt I needed to go as well. This trip made that ten year dream a reality. If you are familiar with my South America travelogue, there will be a few differences in this one. First of all, I’m hoping to actually finish this time. I still want to finish up the Bolivia trip, but it’s starting to fade in memory, which makes it more difficult to write about with the level of detail I like to use. 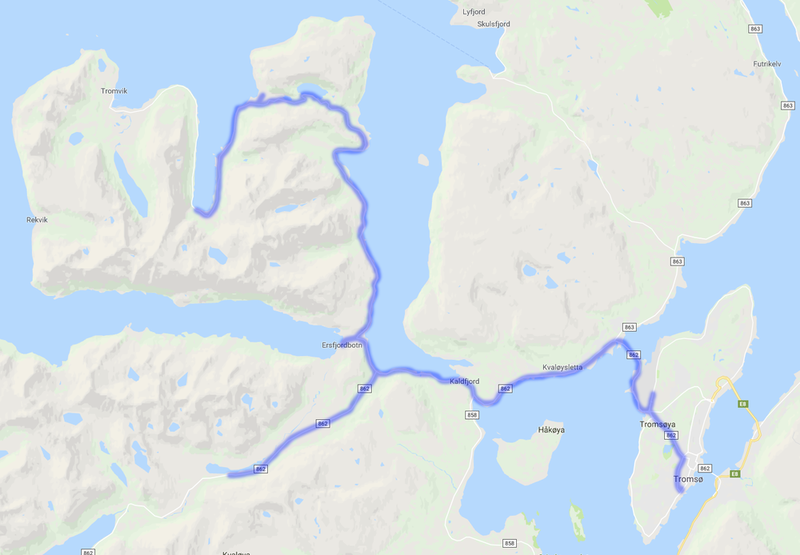 Second, I drove more on this trip (more details on this in a bit), which means there will be fewer interstitial road shots between places. I still like this format for storytelling, and there is no shortage of stories to tell from this trip, but this will make the visual elements more disjointed. I think you will still like the results. Part 0 is a small teaser of what’s to come, with photos from the first night of the trip, the first nine hours of a two week adventure. You can click on all of the aurora pictures in the post to enlarge them and view them against a dark background, where they will look better. After about 24 hours in transit, I landed in Tromsø, Norway, located well above the Arctic Circle. My first task was picking up the rental car. Due to the impending aurora chases, Jake and I elected a vehicle that would let us drive more and not require hotels. You can't see the aurora from inside a hotel. After some searching, we found a company that rented camper vans with a heated bed area in the back. This allowed us to be extremely flexible in planning, which was especially important on the colder nights where we'd otherwise be forced indoors. It was perfect, other than one major issue: the only rental available was stick shift. I didn't know how to drive stick shift before this trip. The rental car in Bolivia was also stick shift, but Jake drove for the entirety of that trip. This time, Jake wouldn’t arrive until a week later than I did. I’d start out on my own. Fortunately, I had a few months before the trip to learn how to drive stick. Three months before leaving for Norway, I took four hours of stick shift lessons in LA (it turns out that the "borrow a friend's car with stick" learning path doesn't really exist anymore). Two weeks before departure, I took more lessons near Boston. Thirty minutes before the end of the last lesson, I asked the instructor to take me to a hill to practice more difficult starts. He refused, saying I wasn't ready and I'd just burn out the clutch. A few weeks before this when I inquired about automatic van rentals, the rental company very tersely explained that clutch damage was not included in their insurance, and should I kill it, I'd be fully liable for the cost of replacement. After the conclusion of the last lesson, I had an anxiety attack in the parking lot. I landed in Tromsø less than 72 hours later. After picking up the car (and somehow managing not to stall pulling away from their garage), I picked up a few groceries and found a hill on a quiet street. I went up and down that hill about twenty times. Stop, start, park, start, park, start, and so on. Once I made it up and down the hill without stalling about ten times, it was time to pull into traffic. My initial plan that night was to go straight into town, where I had a hotel room waiting for me. It was Friday night, I could get good dinner, some beer, and shower off the plane stench. However, the aurora forecast for the night I arrived was very good. The cloud cover forecast was less good, but conditions were pretty clear when I landed. Despite dusk at this latitude lasting for about three hours, I decided to gamble on the impending cloud cover holding off for a few hours longer than forecast. I needed to try something, if there was good aurora while I was in a hotel room, I would have kicked myself for a long time. The shower could wait. After some good luck on the rock half of the beach, I wandered over to the ice half, where the orange lighting was not as bad. Thin sheet ice from a small wash covered the beach, but the ice was over sand, so breaking through wasn't a big deal. Setting up the tripod was an adventure, though, since the legs didn't have anything other than ice to sit on. It's a good thing I brought a cable release, because every press of the shutter caused the entire tripod to shift. Grøtfjord has great views to the north and west, but eventually the aurora brightened in other directions, so I moved on to try another spot. My instinct was to head to the base of a fjord in order to try getting more pictures of the aurora over water. The views from that fjord were not very useful, and the aurora was starting to get extremely active and bright to the south. With the water at my back, I instead pointed my camera at these two hills. They were enough to frame the photo and the brightening aurora did the rest. I didn't really have any moonlight to work with on this trip, and when I left I thought I would be disappointed by that. However, as the aurora got brighter (and this is about as bright as it ever was during the trip), it lit the snow in green. Suddenly I didn't need to worry about the mountains being silhouetted anymore. It was at this point that the jetlag began to catch up with me. 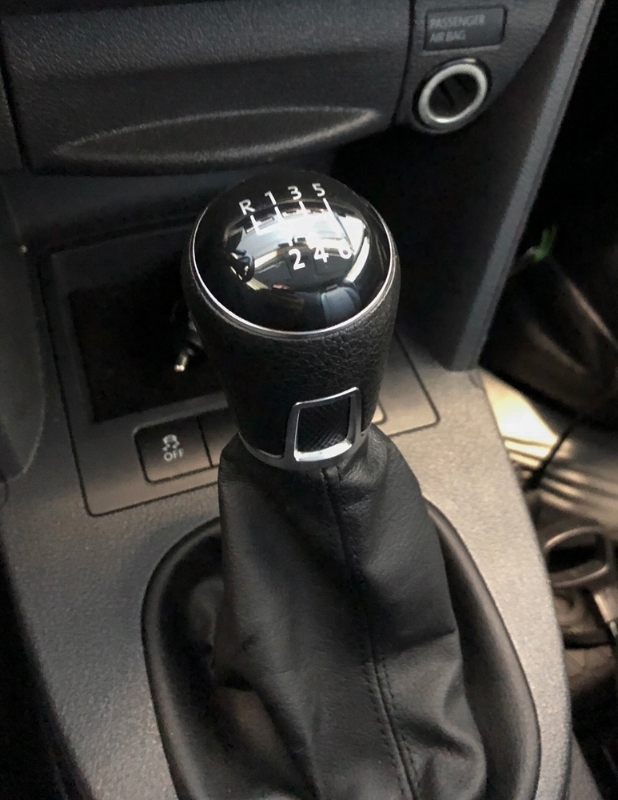 After being relatively secure with the car, I was making more mistakes with the shifter (when accelerating in third, change to fourth, not second). Despite the aurora continuing to be very bright, I started to head back to Tromsø. 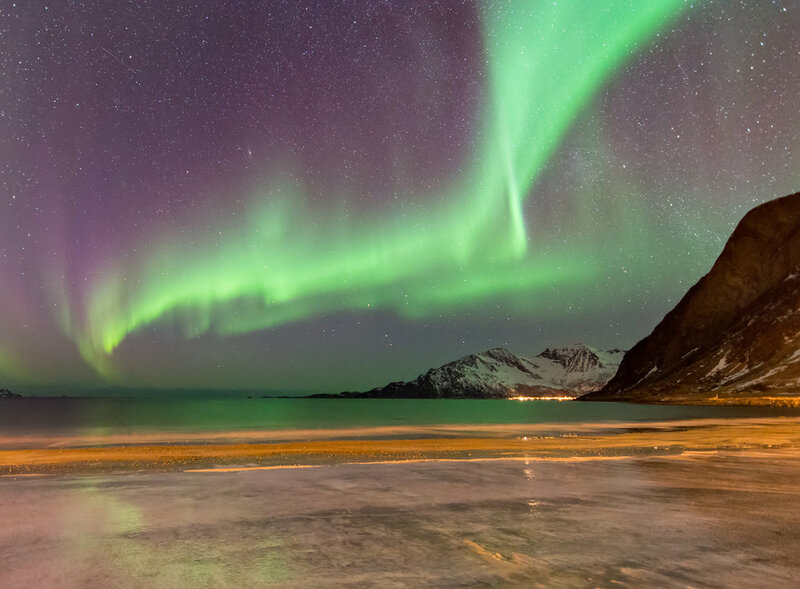 I made one stop in Ersfjordbotn, a very famous aurora viewing spot, where somebody took this picture on the same night. However, when I was there, the aurora was low, and I was too tired to remember how I got down to the water when I scouted the spot earlier in the evening. I arrived at my hotel a little after 1 in the morning, 9 hours after landing and many, many hours after departing Boston on very little sleep. However, my perserverence was wildly successful. This was one of the best aurora nights on the trip, and served as a great first taste of the adventure ahead.